Every dessert made by Nutella sauce is really tempting. Be cautious that you can’t stop eating one mouth after another. 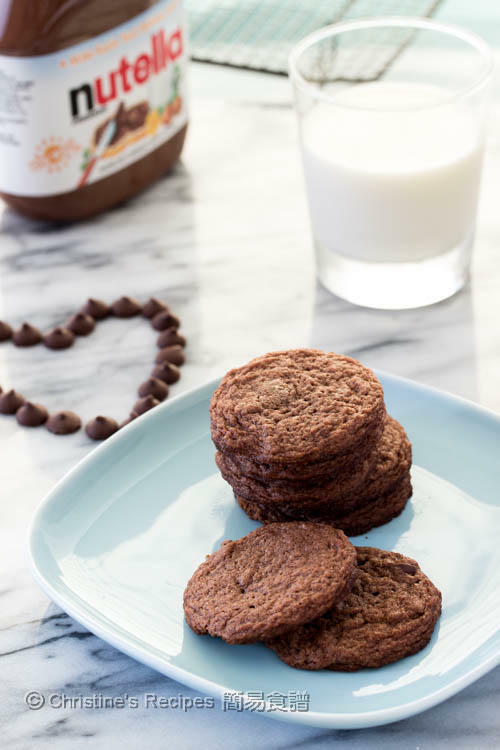 These Nutella cookies are no exception. By adding some chocolate chips and cocoa powder, these cookies are even more addictive. The upside is that these cookies will make you feel refreshed and got mentally energetic again after long hours of work. The texture is quite charming, crisp on edges, slightly chewy in the middle. Taste-wise, they are wonderfully good. No doubt at all, you can make some as a present of Valentine’s Day for your loved one too. Beat the butter with an electric mixer until very light and fluffy. Add brown sugar, caster sugar and Nutella. Mix well. Sift together the flour, cocoa powder, baking soda and salt. Fold into the butter mixture with a spatula. Stir in the chocolate chips. Refrigerate the dough for 20 minutes. Preheat oven to 170C / 330F. Spoon a heaped teaspoon of dough onto a lined baking tray. Each dough should place at least 3cm apart. Bake in the preheated oven for about 10 to 12 minutes. Remove from oven and allow to cool on the tray for 1 to 2 minutes. Transfer the cookies onto a wire rack to cool completely. Enjoy ! 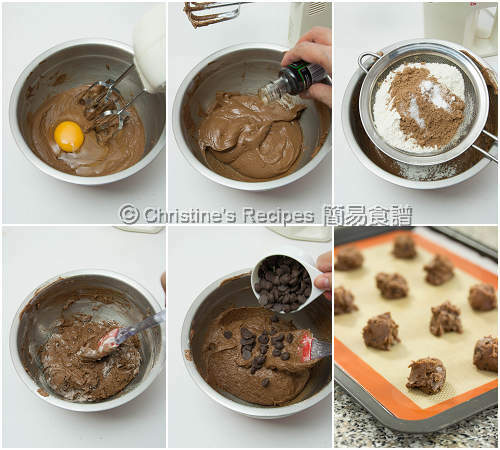 You can bake the cookies in 2 to 3 batches. The dough, not in used, can be chilled in fridge. Make sure the cookies are completely cooled down before storing in an air-tight container. They can be kept for 5 to 7 days. 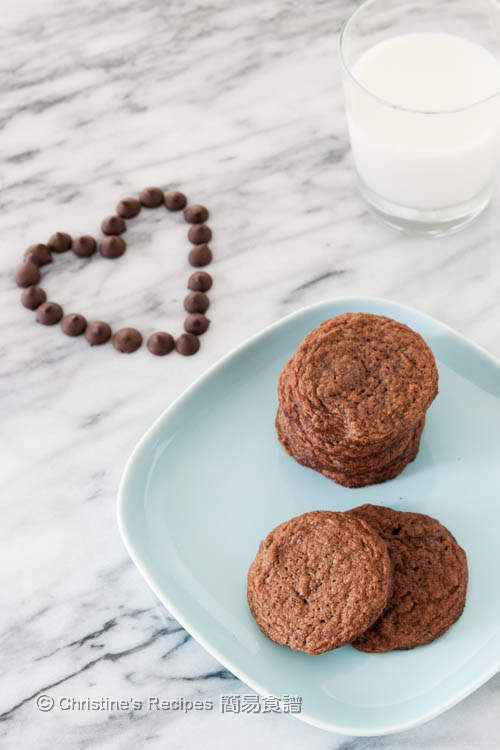 If your cookies are softened because of the weather, you might slightly reheat them in a low-temperature oven for 8 minutes and get them crispy again. Who wouldn't love nutella! These cookies look totally irresistible, Christine. Hi Christine! 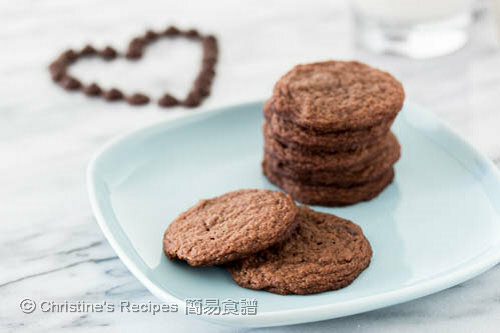 This recipe looks amazing as usual :) just wondering if there was a way to make the cookies rise a bit more and not be so flat? Do cookies that rise more taste better/lighter in taste? We like more Nutella taste, so I added less flour comparatively. If you want your cookies to rise more, you have to add more flour and baking soda. As a result, you'll feel less Nutella taste. Feel free to experiment anyway. The dough can be chilled in fridge for a few days as long as it's wrapped properly. 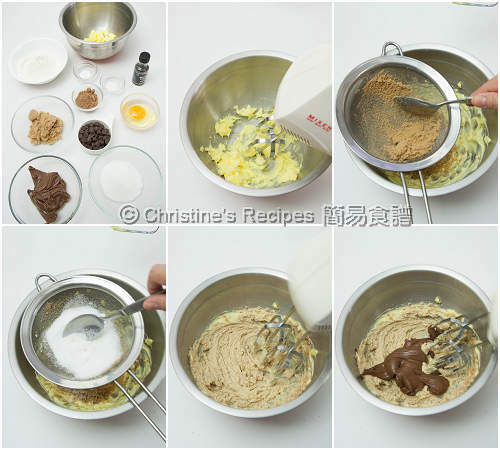 Hi Christine, if I am using a kitchenaid to beat the butter and sugar, d I use the paddle attachment or the whisk attachment? This is something I always wanted to clarify who can bake and cook so well. Thank you. I'd suggest to use paddle attachment to cream the butter and sugar. Mind you that the mixture will form a thick paste and stick to the sides of the bowl if the quantity is too small. The whisk attachment is best for beating egg whites. What is the reason for putting the dough in the fridge? what is the difference if it is not being refrigerated? Thank you! It's trying to keep the butter cold and not melted as a result the cookies will be more crispy. I love your blog! Everything looks so delicious! I would like to know if we should sift the flour and cocoa right into the butter mixture, or we should sift them separately before pouring into the batter? Would there be a difference? Thanks! As for sifting the flour and cocoa powder, either way will do as long as you combine them well. I found no big difference. I would like to know if I would like to replace Nuttella with hershey chocolate bar can? Can I use chocolate bar to replace Nuttella? Haven't tested this recipe with chocolate bar. Guess it works too. But you may need to adjust the amount to be used. This nutella cookie dough contains much sugar. It's easily burnt. Try to lower the bottom heat of your oven a bit next time. Or use a silicon baking sheet like I did shown on the picture. It'd help too.